My name is Nancy Leek. I live in Chico, California and am a retired librarian. I have worked in public, school and academic libraries, including reference librarian for the Butte County Library and children’s librarian at the Orland Free Library. I am the author of John Bidwell: The Adventurous Life of a California Pioneer, and the co-editor (with John Rudderow) of The Miner Poet: The Poems of Pres Longley. In 2015 I started a series of picture book biographies for young readers called Golden State Biographies. So far the series includes John and Annie Bidwell: The Long and the Short of It and Nancy Kelsey Comes over the Mountain. These books have full-color illustrations throughout by the talented Steve Ferchaud. They are colorful, exciting, and fun to read, and I have received enthusiastic feedback from California schoolchildren. All books are available by contacting me at goldfieldsbooksca@gmail.com. I am available for presentations to any kind of group, including 4th grade classes studying California history. I thoroughly enjoy talking with students and will gladly present in your classroom at no charge if you are in my local area (Butte, Glenn and Tehama Counties). I also have a program called A Conversation with Major John Bidwell, in which I play a lady reporter in 1858 interviewing Bidwell, who is played by talented actor Nick Anderson. We have presented this program to groups such as Rotary, SIRS, and the Chico Museum. Let me know if you would like to have us visit your group. I call this blog goldfields because I love Northern California wildflowers and Northern California history. Goldfields is a wildflower that we enjoy seeing every year on Table Mountain here in Butte County, and the goldfields were the attraction that drew so many men and women to the Golden State. Now that I am self-publishing my books, my imprint is Goldfields Books. At my home in Chico I have a little family orchard, a large vegetable garden, and a crazy flock of chickens. When not writing, I sew and volunteer at the library and at Bidwell Mansion. I also sit on the steering committee of the Association for Northern California Historical Research and assist in publishing ANCHR’s yearly book on local history. When my husband Jim and I retired from our jobs in the spring of 2014, we went on a road trip to Wisconsin to visit family. One of my goals on the road was to see some of the sights that the pioneers like John Bidwell and the thousands who followed him would see along the way: Chimney Rock, Scott’s Bluff, Fort Laramie, Independence Rock, the Great Salt Lake and the Humboldt River. 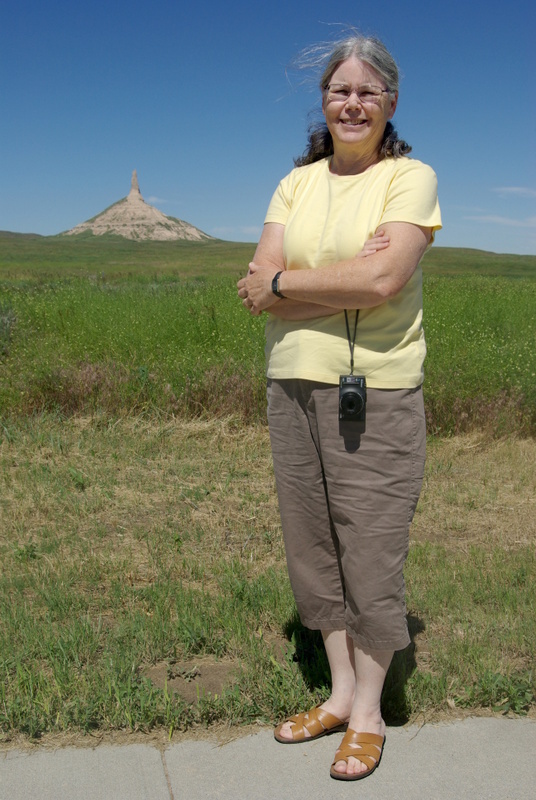 Here I am at Chimney Rock in Nebraska. Hi Nancy, my name is Tyler Ash. Over the last few years I have been bitten by the Butte County history bug and I just recently discovered your blog. I love it! I was thinking about starting a John BIdwell blog but it seems you already beat me to it! I was a student of Byron Wolfe at Chico State and was taught the art of re-photography. I don’t know if you’ve heard of either but I actually did an independent study on rephotographing some of Chico’s historic photos before I graduated. If you’re interested you can view them at my blog,( tylerashresume.wordpress.com). It will be under the Photography tab. I also wrote an in depth article on the George Crosette House in Chico and another article on the history of Chico’s Cold War missile base. Those are on there as well. I love learning more and more of the saga of John Bidwell and I will most definitely need to buy your book and add it to my growing collection of Chico history. I’m so glad I stumbled upon your blog because I think it will be my favorite one for many years to come. Hopefully our paths will cross sometime in the future. Hi Tyler– Thanks for your comment. I haven’t been doing much with this blog lately, but I have good intentions. Your comments are a push in the right direction. Great photos on your website. I find the idea of rephotography very intriguing, and I’ve always admired Byron Wolfe’s work. My daughter is friends with his wife, and their kids are friends. I found your blog super interesting. I love the history of north California too.Good luck!!! I am interested in the street named SO-WIL-LEN-NO. I understand that it is a Maidu Woman’s name. Annie liked the name and named the street. Is this close to the facts??? Was this woman someone special in John and Annie’s lives??? The street is named after Maggie Sowilleno Lafonso — Sowilleno being Maggie’s Indian name. She was a member of the Mechoopda tribe. Maggie was a favorite of Annie Bidwell. She and her brother Elmer frequently dined at the Mansion, and Maggie was Annie’s greatest helper at the Indian Church. I am not quite sure when the street was named, but probably after Maggie died in 1909. That would make a good topic for my blog! Thanks for asking the question. Thank you so much Nancy. I have been looking all over for this answer. I look forward to reading more on your blog. I heard you speak at the Chico Museum and enjoyed it very much. I wonder if you would give your talk at the Newcomers luncheon. The talks are to help newcomers to learn about the area they have moved to . We provide lunch for you and you would speak for about 30 minutes . We need a speaker for November 17th. If you are able to do this please get in contact with me. If you are unable to attend the November luncheon, perhaps next year January 26th, March 25? They will be looking for and mapping the original military road. Did John Bidwell play a part in this road or fort? Hi Sandy– Fort Bidwell was named after John Bidwell, but other than that I don’t know much. But I know someone who might, and I’ll ask. Hi Cheryl– I’d love to have you do a guest post. I’m out of town right now and not thinking about the blog, but we can get together next week. I’ve seen your webpage and I read your stagecoach book. It would be fun to get to know you better.